300 RCM, also known as the 300 Ruger Compact Magnum, is a powerful magnum round that is short in length. The round is designed to be used in an easier to handle short action bolt action rifle. 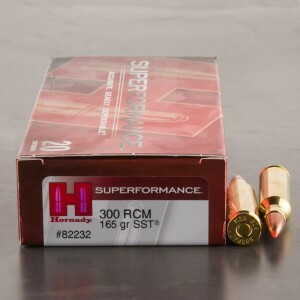 300 RCM ammunition was produced by a partnership between Hornady and Ruger and utilized some of the best features and technology in modern ammunition design. 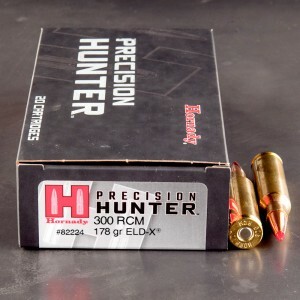 The cartridge is capable of producing excellent ballistics even when fired from shorter barrels. In fact a 20-inch barrel can project a 165 grain bullet at just under 3,000 feet per second. All in all, the 300 RCM is a spectacular cartridge that uses some of the best technology available to produce world class performance. Very accurate out of my ruger guide gun. Broke bones and got a complete pass through at 400 yards on a large doe. Another large doe I shot nearly straight on and it went just right of center and broke 4 ribs and penetrated up to the rear leg. It retained about 120gr. Great price on a great product. Shoots about an inch at 100 yards with my guide gun.